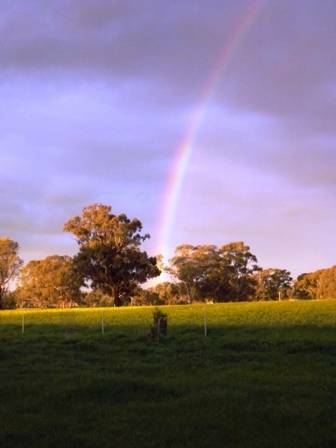 We love a country lifestyle on acreage,near the township of Euroa in the strathbogie region of Victoria. As a young girl I started showing dogs. My first show dog was in 1979, an Australian cattle dog named "Ace" who I took in childhandlers, a couple of ribbons later, is where it all began..I was bitten by the show bug. Some of the other breeds I have shown over the years are Italian Greyhounds- we owned when our daughter was very young, Lena was a constant companion, rest in peace, sweet girl, run like the wind...as only iggies can. Belgian Shepherds- we still have a retired boy, Angelo who is 8 years old now, our protector of the yard, still thinks himself a big puppy chewing up his toys, has not grown up. Will always be young at heart , as all belgians are. Peter comes from a farming background, he loves working dogs, often watching the sheep dog trials at Ag Shows. German Spitzs (mittel) I've had the pleasure of owning since the early 1990's. "Steffie" was from the South Australian knls- "Elhamra" Tony.Crosse. After seeing the German Spitz at the Adelaide Royal with 2 imports, a new breed to this country. I fell in love , and waited 2 years,for Steffie to arrive. I bred my first litter in 1993 and kept a chocolate girl called Beleesha Nut Sundae "Sunny". Litterbrother Ch. Beleesha Bundaberg "Bundy" went too Nueboree Knls nsw,as one of there first foundation boys. Life is such a party if your a german spitz, they don't see themselves as little dogs. Will let you know if something is out of the ordinary, by alert barking, being good little watchdogs, without the guardiness. Just love to be part of the family, good with children. Are very smart doing well in the obedience/agility rings with reward training. Have No doggy odour, coming in a large range of coat colours. Ideal for inside and smaller backyard living, but certainly not a lap dog, active, loving a good brisk walk or playing ball with the kids in the park. "Have we conviced you yet?? be warned they are like potato chips, just can't stop at one, German Spitz "
We Show our dogs at all breeds shows,and support the Country show circuits, just love the relaxed attmosphere, a family day out or camping trip on the weekends. Some of our other interests include, Bushwalking- Australia has so many lovely spots, too discover. Also a keen interest in Aquarium Fish, and Free Range Poultry.